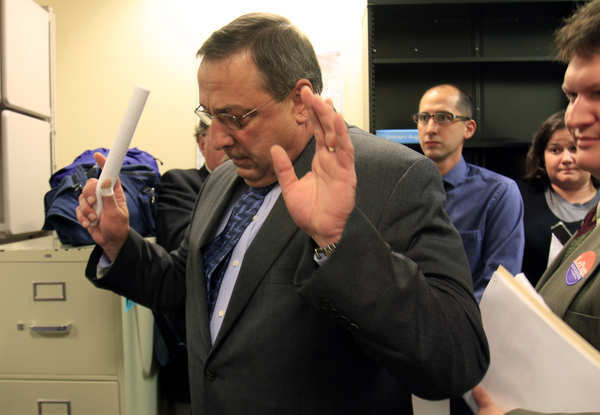 The Maine Sunday Telegram really took a shot at Maine’s Governor Paul LePage today: “Our View: Gov. LePage acts like he’s in over his head“. For the most part, the governor has surrounded himself with people who, like him, are novices to state government. He has filled his administration with people he is comfortable with, politically and personally, and excluded those who could augment his get-tough philosophy with experience, expertise and an occasional dash of common sense. LePage doesn’t seem to take advice from anyone, much less from newspaper editorials, but we’ll offer some anyway. The governor should recruit at least one adviser who can point him in the right direction, warn him when he’s about to make a mistake, counsel him when he’s in trouble. Maybe he could solicit advice from some former governors or other public officials – and act on it. 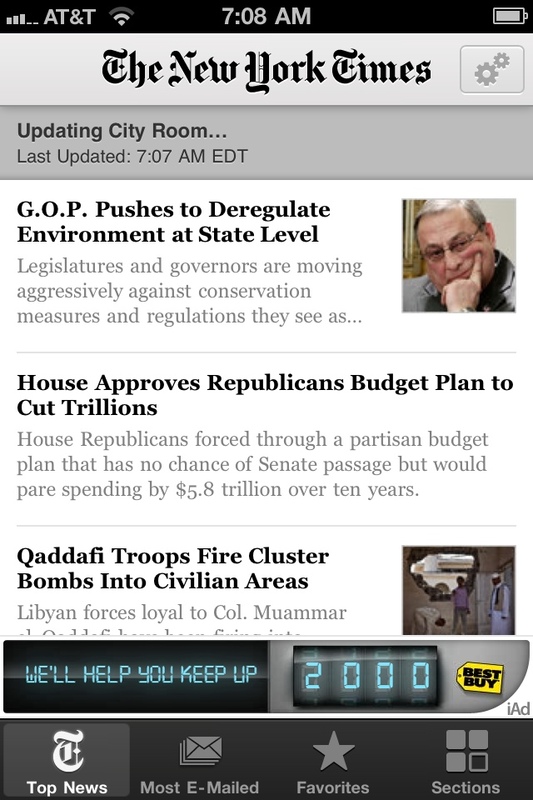 The New York Times likes the whole “Tea Party governors are crazy” storyline. It may not be compelling journalism, but I bet it sells papers. 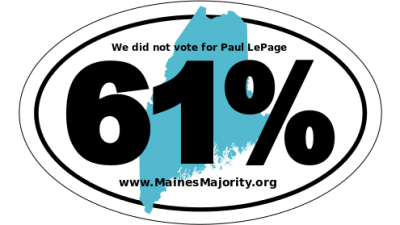 Yep, our fair governor, Paul LePage. Here’s the story “G.O.P. 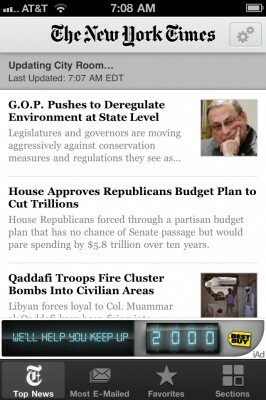 Pushes to Deregulate Environment at State Level” nyti.ms/gmRgz0 (Sorry link is wonky, I’m on my phone). I’m sure you saw that President Obama bestowed the Presidential Medal of Freedom yesterday, but a quote from this article really got to me: “Obama lauds Medal of Freedom recipients“. “Generations from now, when parents teach their children what is meant by courage, the story of John Lewis will come to mind: an American who knew that change could not wait for some other person or some other time,” Obama said. The Georgia congressman said the award was even more special coming from Obama. Also nice that Bill Russell and Maya Angelou were recognized, as well. Maine To Get NRA Plate? Check out the new bill from Augusta: “An Act To Establish a National Rifle Association License Plate“. This would be the first plate in Maine to give money to a private group. North Carolina, Ohio and Tennessee have NRA plates. Paul LePage was just kidding. Honestly. He’s not really THAT dumb. 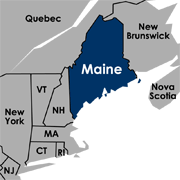 Not to beat this to death, but the other day I quoted the Portland Press Herald who said that incoming Tea Party Governor Paul LePage thought that if 35 states opposed a law it would die law “automatically”. … the introduction of a possible constitutional amendment to allow any provision of federal law or rule to be repealed if at least 35 states object to its implementation. Because he’s not a moron. See, apparently the new Maine government is joining legal fight against the Affordable Care Act (a/k/a “Obamacare”). Not true, according to outgoing Attorney General Janet Mills. Doesn’t that sound like a “fact” that you’d see in some email forward sent from the same person who sends out weekly computer virus warnings or cell phone marketing scams? And now he’s our governor. Thanks everyone who voted for Mitchell, Moody or Scott! I can’t wait until someone tries this in court. Attacks on the long tradition of early and absentee voting in Maine ignore the fact that the popularity of absentee voting in gubernatorial elections has significantly increased voter turnout since at least 2002. This time around, more than 140,000 people voted early or absentee. Any move to eliminate the choice and convenience of this option will restrict voter participation, counter to the core principles of our democratic system. So she wants non-party primaries. Which, granted, could also be seen as sour grapes; she lost the Democratic primary back in the spring. Kind of sour grapes, especially after Down East confirmed Cutler has voted early often. Arrrrggghhh this is not cool. I can’t believe this guy is our governor. Don’t forget to vote on Tuesday. (Unless you’re voting for LePage).